Congratulations to undergraduate Donald Gregorich who was featured in this month's Unmanned Systems Magazine "Ones to Watch" feature (p. 40). 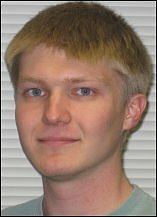 Donald Gregorich has participated in RoboSub 2011 and 2012 as a member of the Robotics@Maryland mechanical team. The team was in charge of developing and maintaining all hardware the team needs to compete, including the robot itself and support hardware, such as replicas of the competition course and equipment for transporting the robot. The team placed in both years Gregorich competed. To read the complete feature, see here.